Original Swiss Army Knife / Knives. 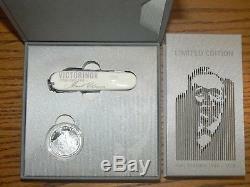 Commemorative Coin & Knife Set. Inclusive of Official Commemorative Coin. 470 produced for North America. New in Special Display Box. Knife has 15 Features: 91mm Long Closed = 3 1/2. Large Blade, Small Blade, Corkscrew. Can Opener, Small Screwdriver, Bottle Opener. Large Screwdriver, Wire Stripper, Reamer. 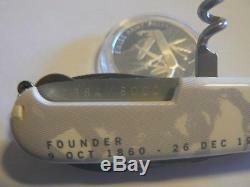 Serial Number stamped under corkscrew. Celebration of a Pioneer Master Cutler. To commemorate the 100th Anniversary of the passing of pioneer. Master cutler Karl Elsener, Swissmint (the Federal Mint). 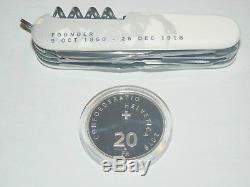 Has produced a 20 franc "Swiss Army Knife" silver coin. Designed by Swiss illustrator and graphic designer Nadja Baltensweiler. 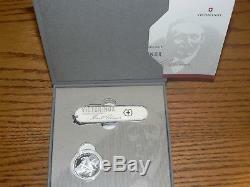 The coin shows the Swiss Army Knife with it's tools displayed against. The stunning backdrop of the Swiss Alps. The set also includes a specially designed edition of the Huntsman. 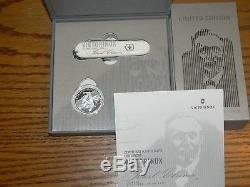 Pocket knife, adorned with the signature of Karl Elsener. 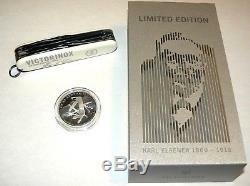 Only 470 pieces of the Karl Elsener Commemorative Coin Set 2018. Will be available in North America, making this pair a coveted exclusive. 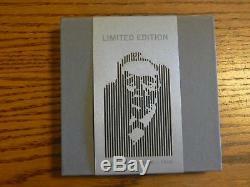 For collectors and enthusiasts around the globe. We will respond within 24 hours. 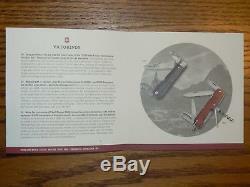 Victorinox AG guarantees all knives and tools to be of first class stainless steel and. Also guarantees a life time against any defects in material and workmanship (save for electronic components 2 years). Damage caused by normal wear and tear, misuse or abuse are not covered by this guarantee. 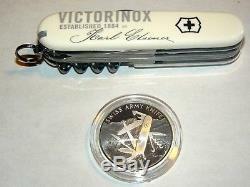 The item "New Victorinox Swiss Army Karl Elsener Commemorative Knife & Silver Coin Set" is in sale since Tuesday, September 4, 2018. This item is in the category "Collectibles\Knives, Swords & Blades\Collectible Folding Knives\Modern Folding Knives\Factory Manufactured". 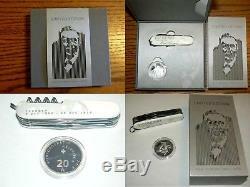 The seller is "central_valley_wholesale_goods" and is located in San Jose, California. This item can be shipped to United States.